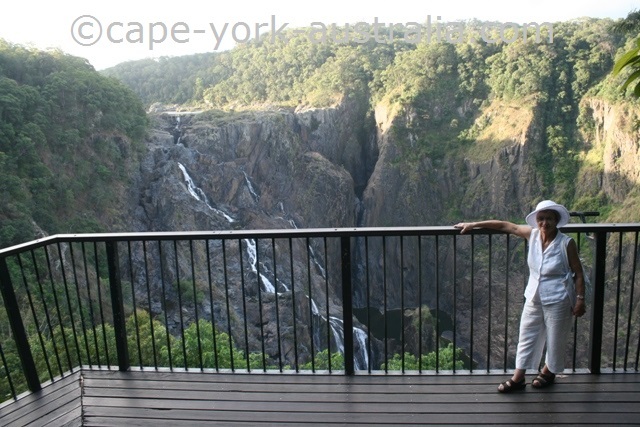 Kuranda is a popular place to visit in this part of Australia. 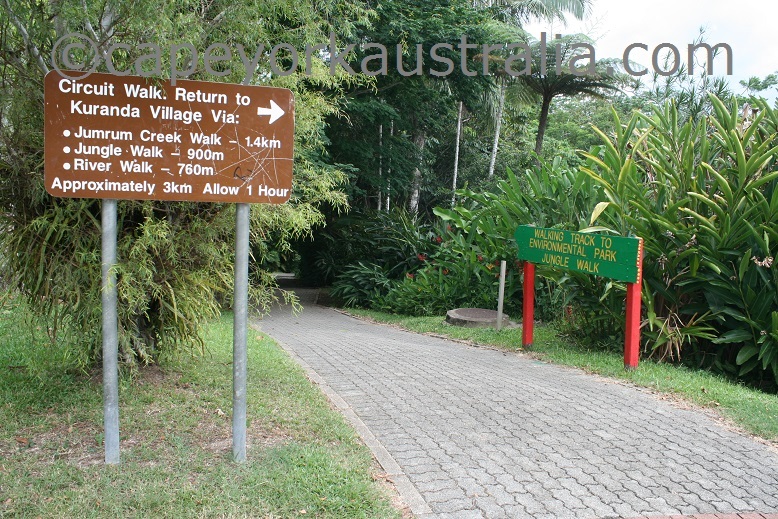 It is a cute small rainforest village up in the mountains of the Great Dividing Range west of Cairns. 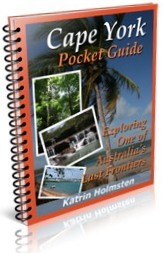 If you only visit Cairns and don't go to Daintree National Park or the rest of Cape York, it is a great place where to discover the local tropical rainforests. 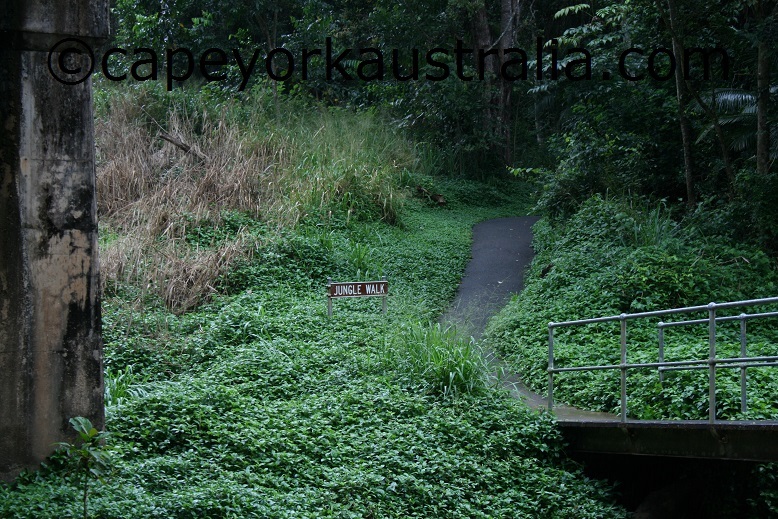 But it is mostly known for its markets; and it is famous as a destination of a day trip from Cairns - which can be made with a scenic historical train one way, and a skyrail the other. And it is just as easy, and much cheaper, to drive up to the rainforested mountain range. 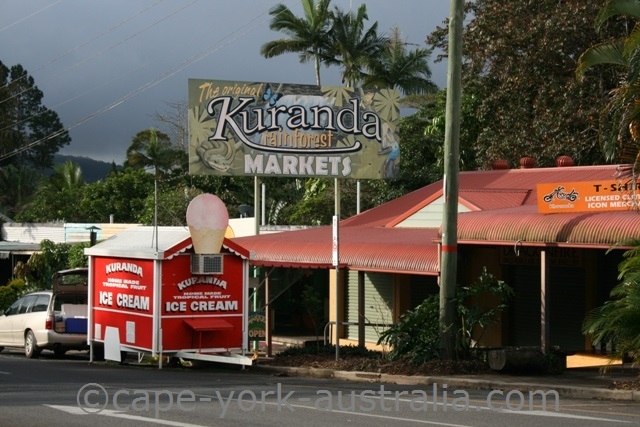 The famous Kuranda markets opened in 1978, and today they are the town's biggest attraction. There are the old, Original Markets as well as the new Heritage Markets, which sell all sorts of things from locally produced honey to fashion clothing and gemstones. There are also some great wildlife parks. 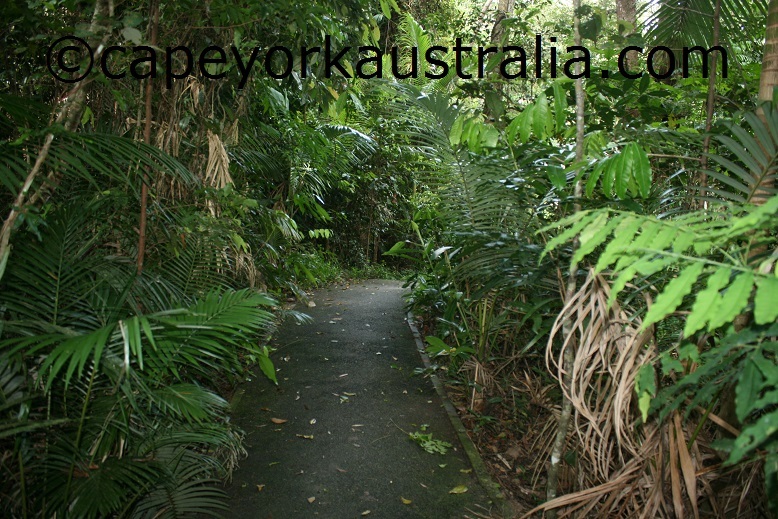 The Australian Butterfly Sanctuary is the largest of its kind in Australia. 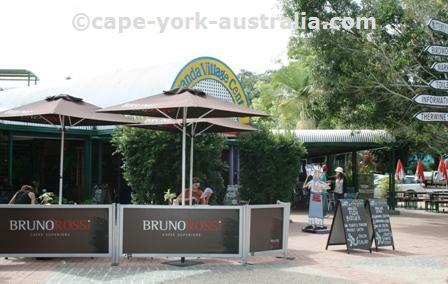 There is also the Birdworld with both Australian and exotic birds, and the Koala Gardens with all kinds of Australian animals. 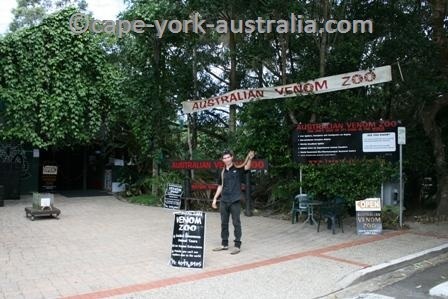 And there is the Venom Zoo, with dangerous animals. The town promotes itself as a rainforest village and this is exactly what it is. 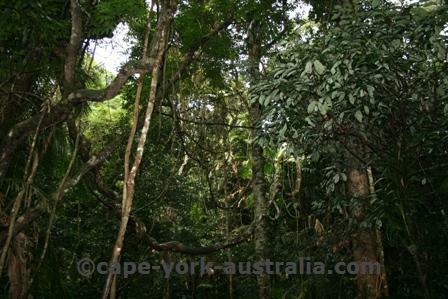 It is surrounded by some of the best tropical rainforests in Australia. 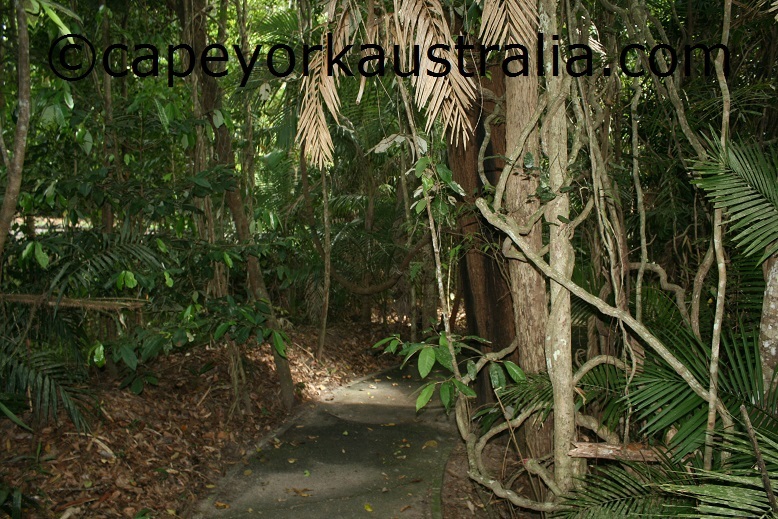 There is a nice circuit walking track along the river and through the rainforest where you can discover the local flora and fauna. 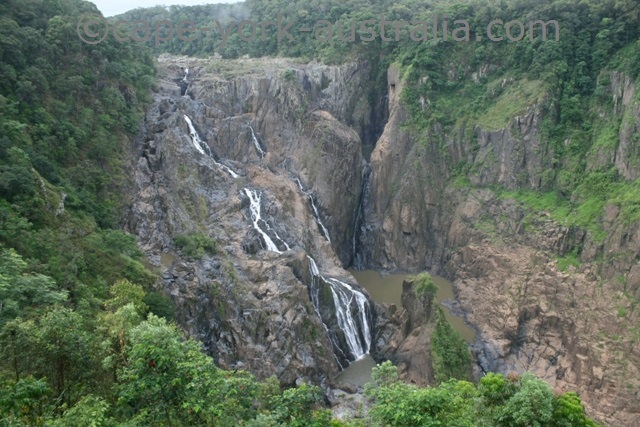 A little farther from the town centre are Wright's Lookout, and the beautiful Barron Falls - some of the most impressive in the whole tropical north Queensland. It's a little walk from the car park, but it's worth every step - once down, the views are absolutely beautiful. 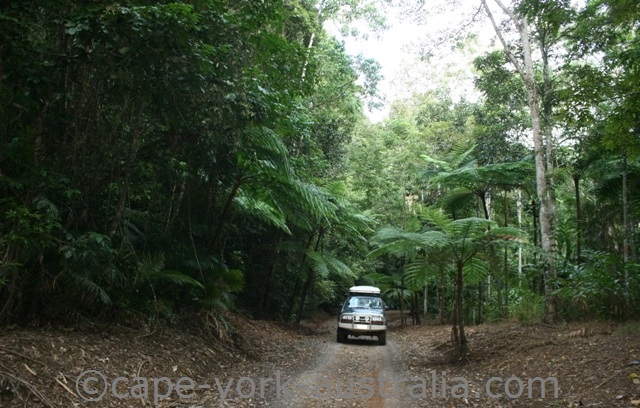 And even further out, if you have a four wheel drive like Cape York travellers, there are an amazing amount of excellent walking and 4WD tracks around Kuranda. Bridle Creek Track, Clohesy River Road, and McDonalds Track only to name a few. 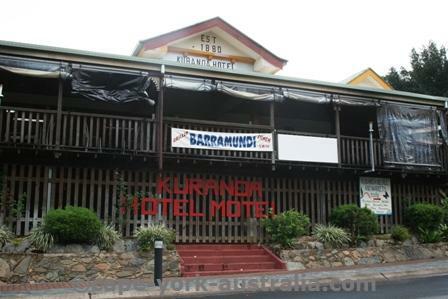 There are a few places to stay in town: The Hotel Motel, a backpackers hostel and Kuranda Villas are central in the town. 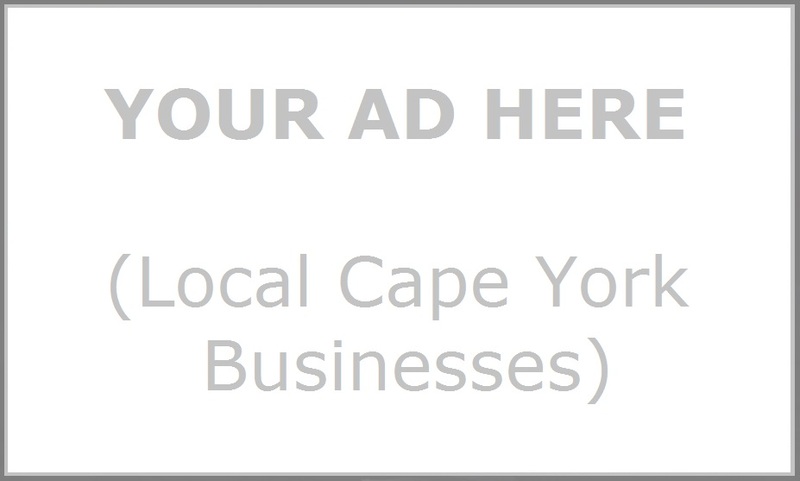 A resort and spa, a caravan park and two bed and breakfast places are a bit further than walking distance from the central streets. There is a surprising variety of restaurants in town - everything from fish and chips and typical Australian tucker like barramundi and kangaroo, to European cuisine such as Italian and German, and other international like a Curry House, and Vietnamese. 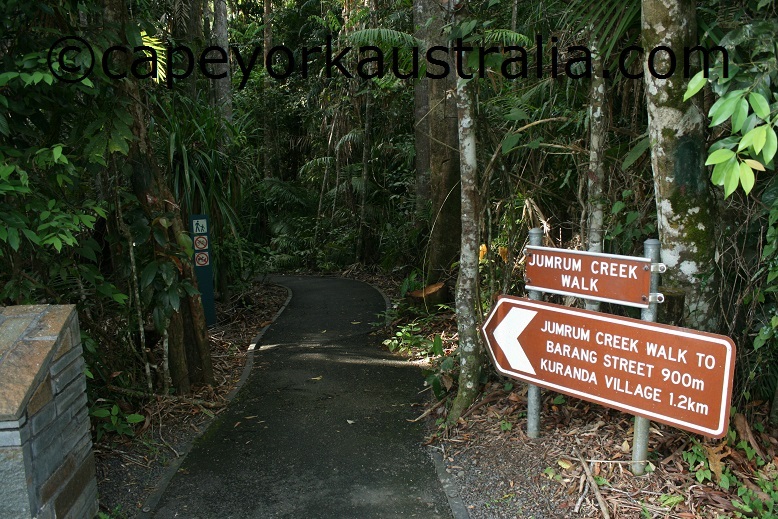 There are a few tour operators that take you to Kuranda from Cairns. 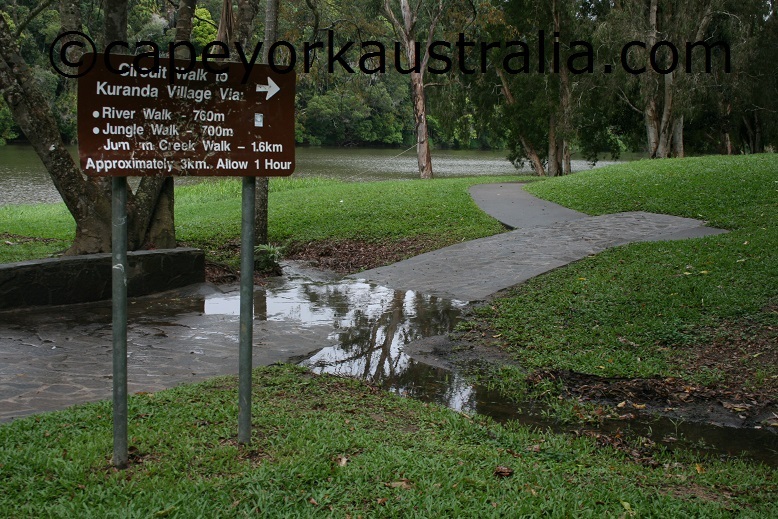 There are also a few in Kuranda itself, and one of the most popular is the river boat tour on Barron River. 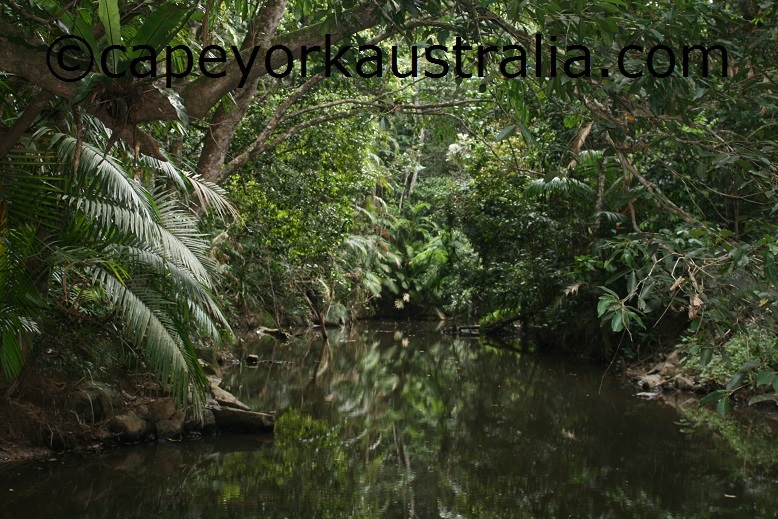 It takes you past some dense rainforest where you can see some birds, turtles and freshwater crocodiles. The riverboat tours depart from the jetty just behind Kuranda Train Station - which is a tourist attraction itself. 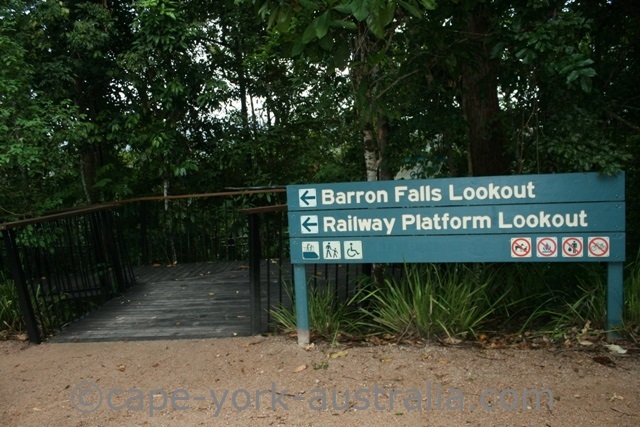 A lot of people arrive here from Cairns with the Scenic Railway, which takes you through the rainforests of Barron Gorge National Park and past the impressive Barron Falls. Most people take the Skyrail back to Cairns. 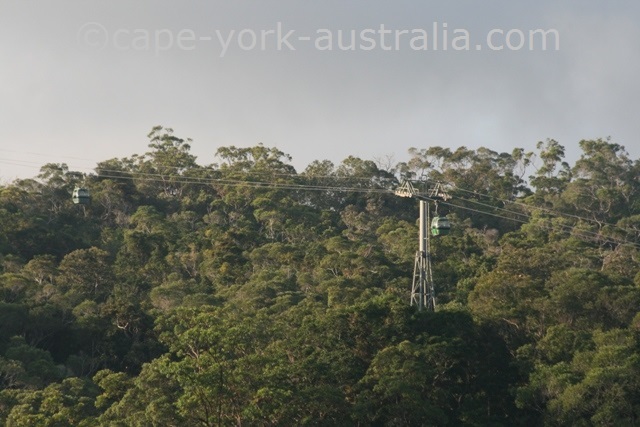 It is a great ride across the top of the rainforest canopy with views over the ocean. 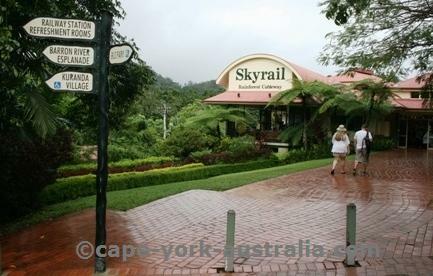 The Skyrail trip ends in the Cairns northern suburb of Smithfield, next to the famous Tjapukai Aboriginal Cultural Park. 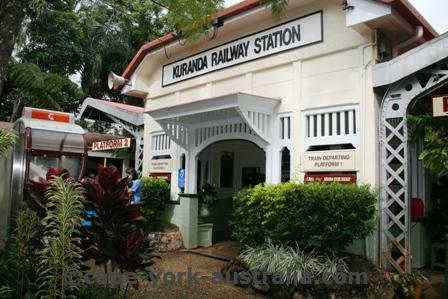 On this page you have the Kuranda tours. 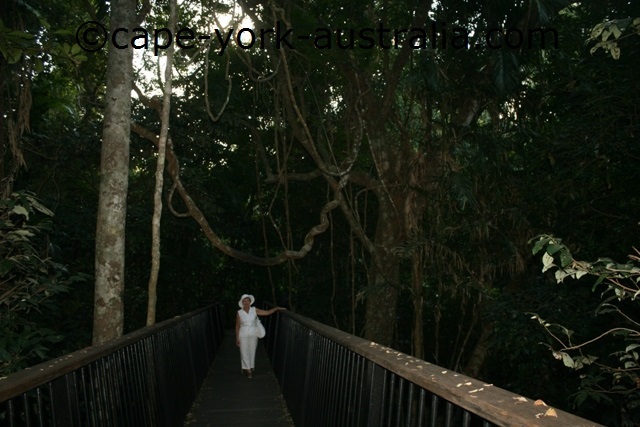 The most popular one is to make the day trip from Cairns, with the Old Scenic Railway one way, and the Skyrail the other. The day can be spent discovering the famous markets, rainforests and Kuranda's wildlife parks. 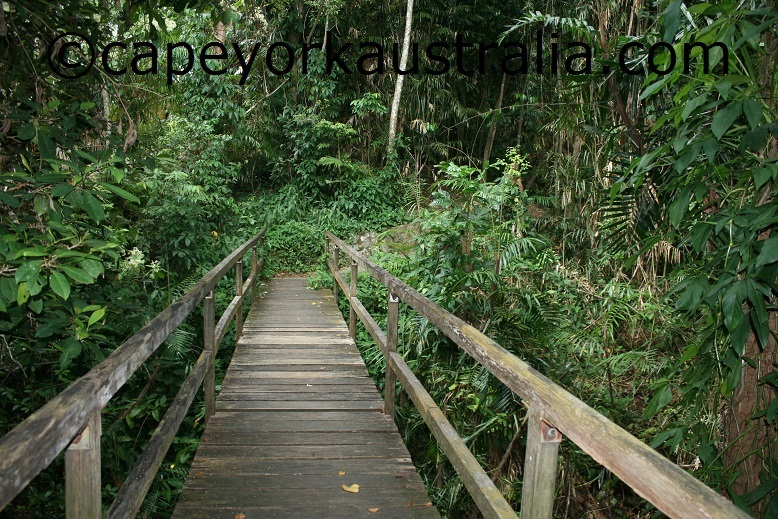 In the end of the Skyrail trip is the famous Tjapukai Aboriginal Cultural Park - a great place to learn about the culture of local indigenous people. But there are many other tours. You can also take helicopter flights as well as tours that combine Kuranda with a Great Barrier Reef trip on the water. 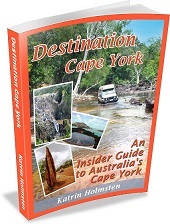 The full list is in the Destination Guide. Kuranda markets are very popular. 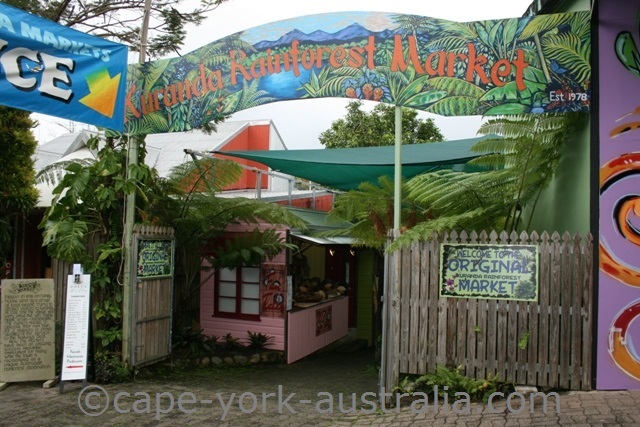 There are also the rainforests and wildlife parks, but the markets are the most popular thing to visit in Kuranda. And they are not all the same markets. 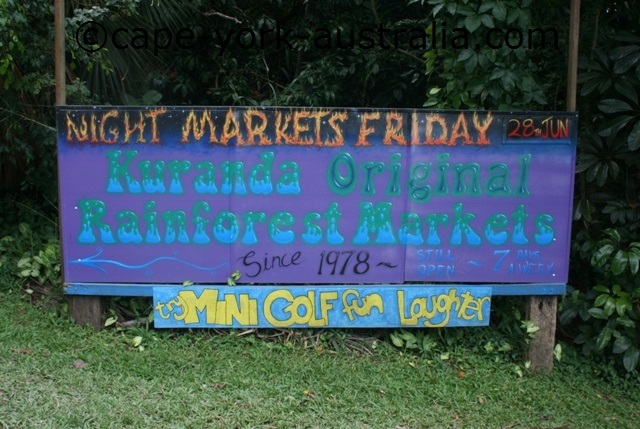 The most original are the oldest - Kuranda Original Markets, sometimes also called Rainforest Markets. At the same location, sometimes - about once a month, there are also the Night Markets. 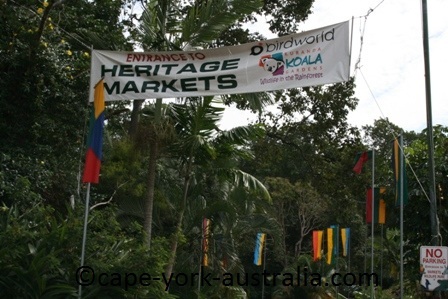 But there are also newer ones - such as the Heritage Markets. 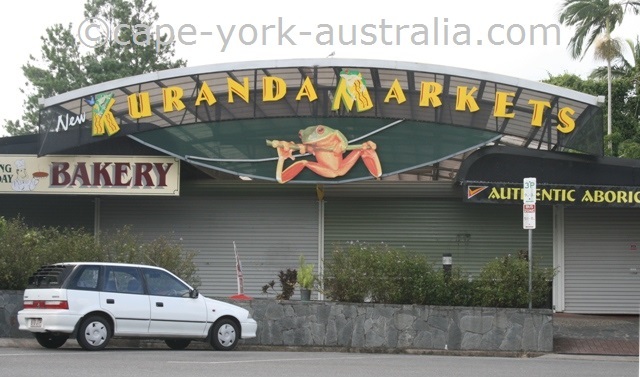 And on top of that, now there are also the "Kuranda New Markets"! It is dense and lush, and covered in vines. You can experience it by taking some of the walking tracks in and around the town. The most central one is the one starting at the train station (take the steps down to the river). It goes in a circle back to the town. 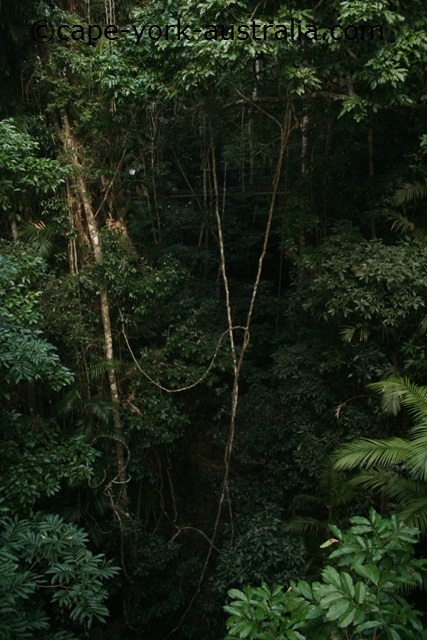 The lush Kuranda rainforest next to the river. 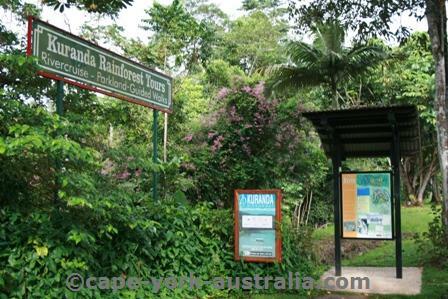 which has more beautiful rainforest..
.. before it comes out to Kuranda Bat Rescue and the central streets in town. The other end of the circuit walk. 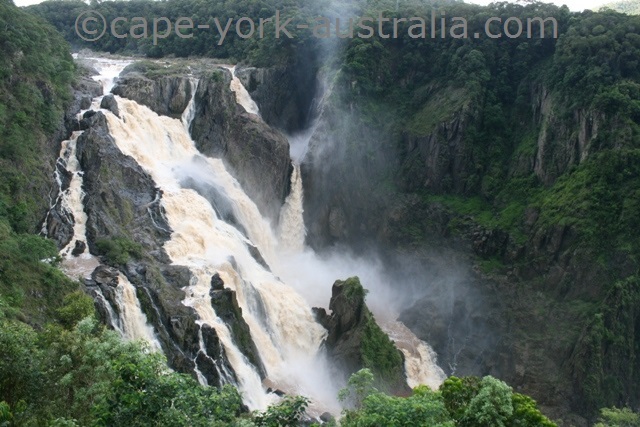 Barron Falls are excellent looking waterfalls. They are some of the best waterfalls in the whole north Queensland. They are tall, they are huge, and they roar massively after rains. 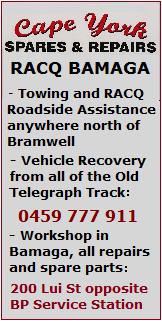 They are a little drive away from the town centre, there is even a shuttle bus. 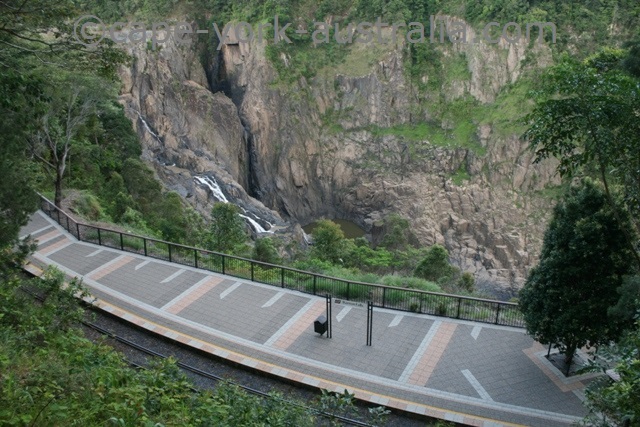 In case you are visiting with Skyrail or Scenic Railway you also get to see them on your trip from Cairns to Kuranda. If you are driving, just follow the signs from the town. 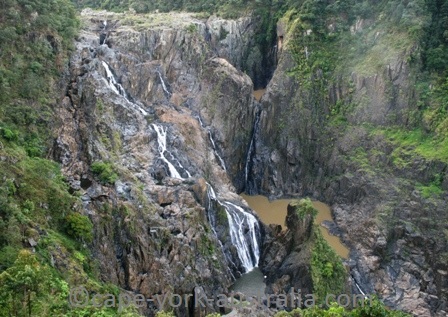 From the Barron Falls carpark, there is a little walk. 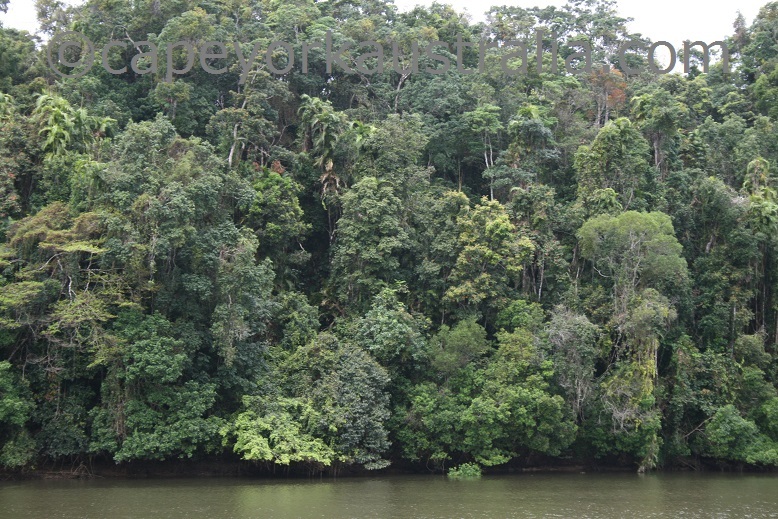 It goes through some beautiful rainforest. You can also see the train station, and the Skyrail going past. After about 600m walk you come to the main lookout (from here you can also walk down to the railway station, for a different view again). But wait until you see them in the Wet!! In fact it does not need to be the Wet season - if you are in Kuranda and it has rained, head to the falls, they are roaring.